Community members eat lunch at Mt. 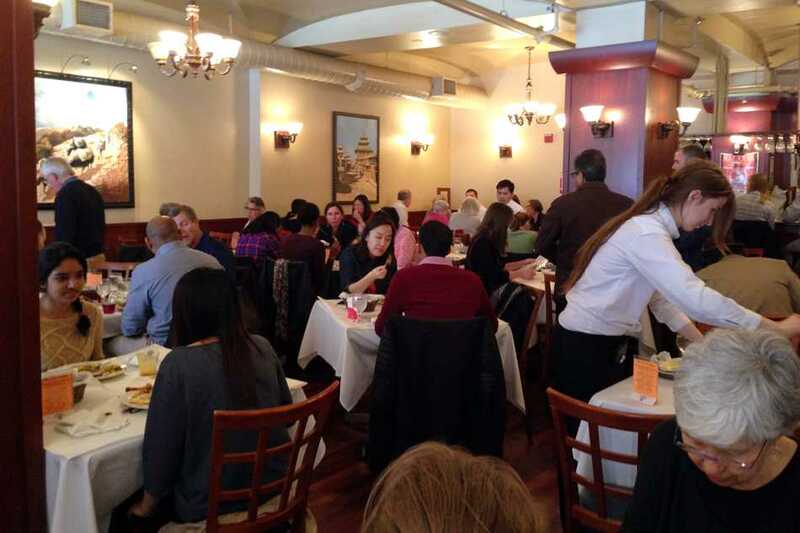 Everest Restaurant during the restaurant’s Nepal earthquake fundraising luncheon hosted with Hagerty Consulting. More than 200 people showed up and over $15,000 were raised for survivors of the earthquake. Two Evanston businesses teamed up Thursday to raise money for the victims of the Nepal earthquake. Mt. Everest Restaurant, 630 Church St., and Hagerty Consulting, 1618 Orrington Ave., held a fundraiser at the restaurant to benefit both the Nepali American Center’s Nepal Earthquake Relief Fund and AmeriCares, a non-profit emergency response organization. On April 25, an estimated 7.8 magnitude earthquake hit Nepal near its capital, Kathmandu. More than 5,500 people were killed and thousands have been injured. Hagerty said his company came up with the idea for the fundraiser two days before the event. The consulting firm will match 100 percent of the donations to AmeriCares collected at the door. Hagerty Consulting raised more than $15,000 for AmeriCares, with more than 200 people attending the buffet, Wendi Kromash, the firm’s marketing and communications manager, said in an email to The Daily. Ramakant Kharel, who owns Mt. Everest, said his restaurant has long been involved in fundraising efforts, going back to when 9/11 occurred shortly after he first opened. Originally from Nepal, Kharel said he decided to give money to the Nepali American Center’s Nepal Earthquake Relief Fund because he is on the organization’s fundraising and financing team. Ten percent of all lunch sales on Thursday went to the relief fund. Kharel’s restaurant is also serving as a donation center for the Nepali American Center, and is accepting canned foods, tents, water filters and other supplies. Beyond helping the people of Nepal, the event was also a way for people in the Evanston business community to support each other, Hagerty said. Evanston resident Patrick Hughes said attending the lunch served as a way to feel more connected to the people of Nepal. Many attendees emphasized the range of people who came out to the event, from students to aldermen to nonprofit groups. Kharel said he was pleased with the turnout and said he hoped to see a similar crowd at a lunch event he is hosting Sunday, when 100 percent of the proceeds will go toward helping survivors of the earthquake.